Adriana Joy Fittipaldi, 3 months old, joined the angels in heaven on March 20, 2019 unexpectedly. Born on December 22, 2018 she was the daughter of Joseph William and Jessica M. (Wanchalk) Fittipaldi, of Manheim Township. Adriana’s short life brought so much love and joy into this world. Surviving in addition to her parents is a brother, Walker David age 3, maternal grandparents, Beverly and David Wanchalk, of Brownstown, paternal grandparents, Susan and William Southward, of Lancaster, and many aunts, uncles, and cousins. My sincere sympathy in your loss. May memories live forever in your hearts and may you trust God to console your breaken hearts and find joy in your lives. Joey, Jess and Walker – I feel as if I know all of you through Brenda. My heart is broken for all of you and your family and friends. As a mother who has lost her only child, I know your pain. I was lucky enough to have my son, Seth, for 17 years. The happiness that Adriana Joy brought to you in her short life is irreplaceable. You are a beautiful family and I know that you have a long road ahead. Please keep every memory, smile and moment close in your hearts. A pastor once asked…”if God told you that you could choose to have your child again knowing that it would only be for a short time…would you do it?” I know that I would because it is a love like no other. Please take care of yourselves, she is always with you. My heart is breaking for you and your entire family. My granddaughter Ariana is in the three-year-old class at Trinity. 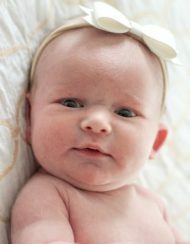 I was so sorry to hear of the loss of your little girl especially as I just had a great granddaughter born in December. May God keep his hand upon you at this time and give you peace and comfort. Dear Joe and Jess, our hearts ache for you at the passing of your precious Adriana Joy. There are no words that can express the depth of our sorrow for your loss. May all the love that surrounds you and Adriana help comfort you during this saddest of times. We love you. We are so incredibly sorry for your loss and are praying for you. There are no words for what you are going through, just know we are thinking of you and hope you can find some peace through it all. Please accept our sincere condolences. We wish you all comfort in the unbearable loss of Adriana. Tears in Heaven. My thoughts are with you and especially Walker. God bless you all and give you strength to face the difficult days ahead. You are all in our thoughts and prayers. We are so sorry for your loss. With deepest sympathy for the loss of your daughter. You are in my thoughts and prayers. We are deeply sorry for your loss. We send you and your family our heartfelt prayers that you may find the strength you need to get through this awful tragedy. You will be in my prayers. I know you guy’s don’t know me. So when I was looking through the Obituaries I noticed your page came up of your little Angel. So out of respect I just wanted to send out my Prayers to you and the rest of your Families and Friends of your loss of your beautiful little girl. I know what it’s like to lose a child. My daughter passed away too. So again I’m so sorry about your precious daughter. I am so sorry for your loss. Praying for the family cant even imagine wat your going through so sad. We lost our little cousin wen she was ten months old due to pneumonia…. deepest sympathy. Dear Bill, So very sorry to hear of the passing of your precious little girl. Our prayers and thoughts are with you and your family at this most difficult time. God bless her. She is now in the palm of His hands. I’m so incredibly sorry for your loss. My heart hurts for you and I’ve never even met you guys in person. Thinking of you and your family. I wish there were some way to bring your little girl back to you. But always cherish the brief, wonderful time you had with her, I hope those memories help to sustain you through this terrible time. My Deepest Heartfelt Sympathy Goes Out to You and Your Loved Ones. I am so sorry for the loss of your beautiful Angel. May Gods Hands Comfort you in this very saddened time of your Life.